Properties in Twinbrook average 4.6 out of 5 stars. Property 3: Pet friendly..handicap access..easy winter entry..
Property 4: “Living The Dream” - Private Log Cabin w/ Mountain Views Has It All! Property 11: Private Paradise with Spectacular Views! Sweet Serenity - an authentic log cabin, with a modern twist. Property 20: Sweet Serenity - an authentic log cabin, with a modern twist. Property 25: Lets Go Skiing! Close to the slope, walking distance to town! Hibernation Hollow Getaway. Pet friendly. Motorcycle friendly. Property 26: Hibernation Hollow Getaway. Pet friendly. Motorcycle friendly. A cozy cabin right in the heart of Maggie Valley! 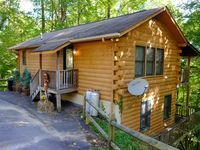 Property 28: A cozy cabin right in the heart of Maggie Valley! 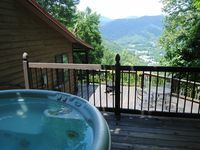 Property 31: Maggie Valley Home w/ Hot Tub & Forest Views! Lose yourself in the clouds! Newly renovated couples get away. Property 41: Lose yourself in the clouds! Newly renovated couples get away. NEW! Maggie Valley Cabin 1 Mi to Festival Grounds! Property 42: NEW! Maggie Valley Cabin 1 Mi to Festival Grounds! Great mountain getaway. The cabin had everything we needed. The views from the deck were amazing. The drive up the mountain to the cabin was scary, but we are from Florida. Hunter was great, met us upon arrival and lead the way to cabin and went over everything and checked on us mid trip to make sure all was well. Nice relaxing getaway, truly the views are amazing.